Sometimes we find certain articles which are interesting to read. Usually people take screenshots on their phone to save these webpages and articles but if it is a long webpage or an article then they have to take multiple screenshots to store them. This makes it harder to keep and read these articles on a later date. Students generally find it easier to save their results and admit cards by taking screenshots and pictures of the webpage. For the purpose of saving articles, websites like Wikipedia has an option to save the article as PDF and readers can also get a printable version. In desktops and laptops many people are aware of this printer known as “Microsoft Print to PDF”. This printer comes pre-installed with the Windows Operating System and can be used to save online web pages and articles, it is very helpful for the people who don’t have a printer or for those are traveling too much. This printer usually act as an virtual printer which can save web pages into PDF files. This printer can also be used in Microsoft Word, Excel, PowerPoint and other office products. However, in Microsoft Office there is already an option to save documents/sheets/presentations as PDF. Whenever these PDF files are printed they give more accurate margins and text alignments. 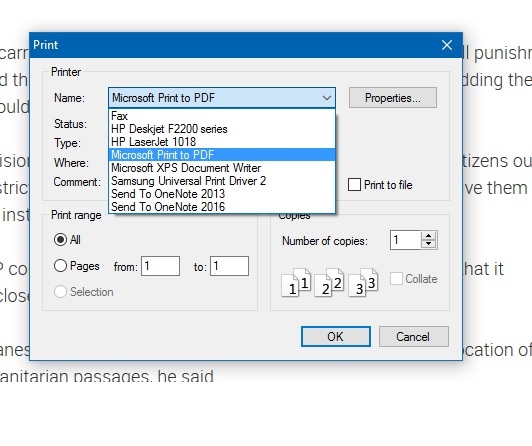 This Microsoft Print to PDF printer can be used in all the Web Browsers. Firefox– If you find any interesting article then just go to File>Print and select “Microsoft Print to PDF” then click Print, it will ask you for location where the PDF file will be saved. Alternatively, you can also use shortcut for print i.e. Ctrl+P. If you want set margins then go to File> Print Preview, here you can set the Scale percentage. In the page setup you can choose the page size and set margins. 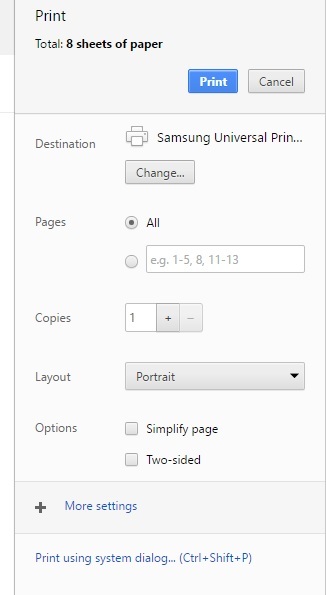 You can also choose what to print in the headers and footers, after setting this up you can again print the page as PDF by choosing “Microsoft Print to PDF” printer. 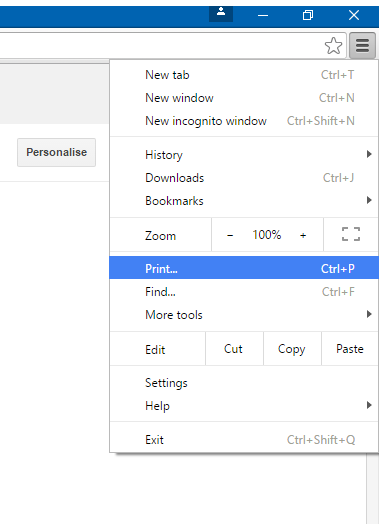 Chrome– In Google Chrome you can go to Options> Print (Alternatively Ctrl+P) this will pop up a print preview windows here you can select the printer and also setup the page. Google Play Store is having many apps for printing webpage into PDF but the proper way to save an article is by using Google Chrome. 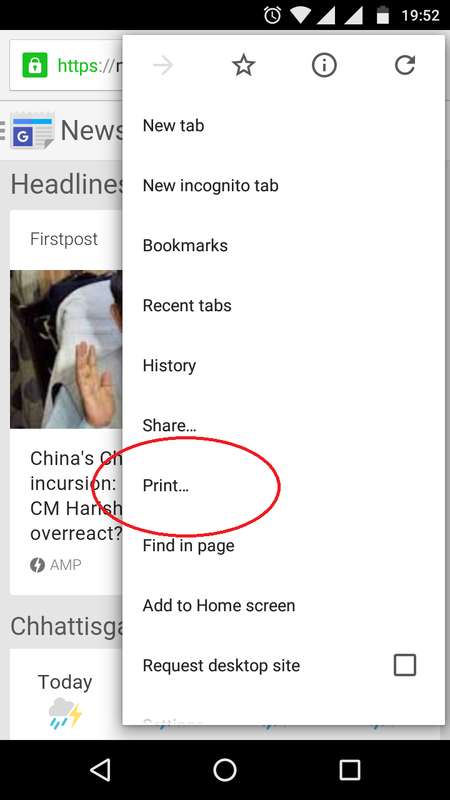 It will give you accurate printable material from websites, just download Google Chrome from Google Play store.If there is an article you want to print, then go to Chrome options and select Print then tap on PDF icon which is located in the right side it will ask you for the location where the PDF file will be saved. There are many other softwares that can be used for this purpose but these softwares are not always free and will serve ads. So, it is better to use the stock and classical way of doing things.